We will offer the following real property at auction at the land located from Madison, SD – 1 ½ miles east on Hwy. #34, then 9 ½ miles south on Hwy. #19 and 2 miles east on 244th St. to the SE Corner of the Land at the Jct. of 459th Ave. & 244th St.; from the Franklin Corner on Hwy. #19 – 3 miles south on Hwy. #19 and 2 miles east on 244th St.; from Chester, SD – 3 miles west on 241st St., 3 miles south on Co. Hwy. (461st Ave.) and 2 miles west on 244th St.; from Colton, SD – 3 miles west on Co. Hwy. (248th St.), 4 miles north on 461st Ave. (Hwy. #155) to the County Line, then 2 miles east on 244th St. 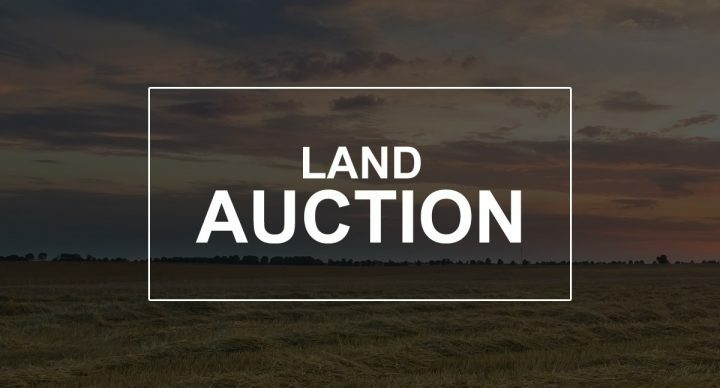 This auction presents a great opportunity to purchase a productive parcel of Lake County, SD land that has been in the Haugmo & Roling families for many decades. This is farm that has a mixture of productive cropland, along with some areas that may provide a haven for deer, pheasants, waterfowl and other wildlife, thus this property affords a combination of income, hunting and recreational opportunities, uncommonly found on one parcel of land. According to FSA information this +/-154.61 acre farm has approx. 134.77 acres of cropland, with an FSA 125.06 acre corn base with a 143 bu. PLC yield and a 3.74 acre soybean base with a 44 bu. PLC yield, with this farm enrolled under the ARC County election of the USDA farm program. The nontillable portion of this farm are comprised of some pasture, grassland, creek, lowland and roads. According to the Lake Co. Assessor this parcel has an Overall Soil Rating of .706, similarly info. obtained from Surety Agri Data, Inc. indicates that this farm has an overall productivity index of 70.7. This general topography of this land is level to gently rolling, with some low lying land in the lowland and drainage areas. The 2017 RE taxes payable in 2018 on this property were $2,960.00. This land is located in Franklin Township in southern Lake County bordering Taopi Twp. in Minnehaha County, which is a highly regarded agricultural and recreational/hunting area. This is a farm that could serve as an excellent addition to an area row crop farming operation and/or investment property, complemented by some excellent hunting and recreational opportunities. LEGAL DESC. : The SE ¼, Except Lot 1 & Lot 2 of Henry Laun Add’n., in Sec. 35, T. 105N. R. 52W., (Franklin Twp. ), Lake Co., SD. 459th Ave., & 244th St.